This was the second church and cemetery started by this congregation. The cemetery was founded in 1865 with land deeded by Jacob Korn. 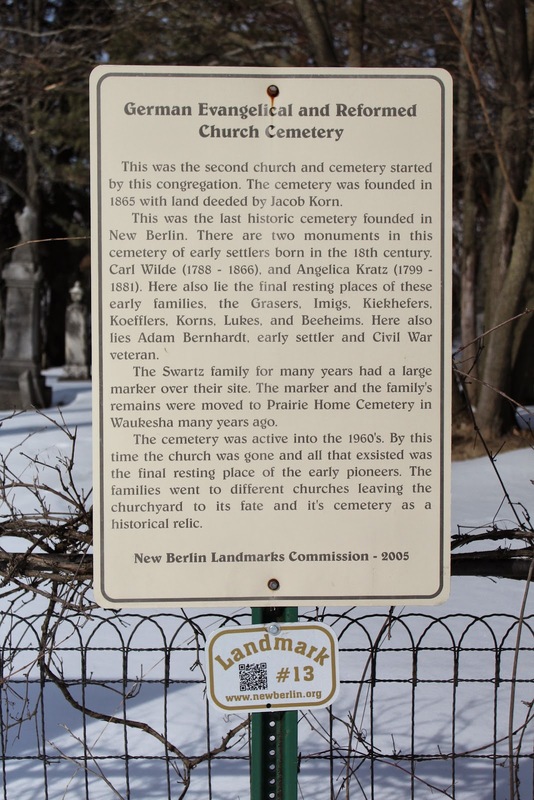 This was the last historic cemetery founded in New Berlin. There are two monuments in this cemetery of early settlers born in the 18th century, Carl Wilde (1788-1866) and Angelica Kranz (1799-1881). Here also lie the final resting places of these early families, The Grazers, Imigs, Kickhefers, Koeffers, Korns, Lukes and Beehelms. Here are lies Adam Bernhardt, early settler and Civil War veteran. The Swartz family for many years had a large marker over their site. The marker and the family's remains were moved to the Prairie Home Cemetery in Waukesha many years ago. The cemetery was active into the 1960's. By this time the church was gone and all that existed was the final resting place of the early pioneers. The families went to different churches leaving the churchyard to its fate and its cemetery as a historical relic. The cemetery and marker are located on northbound South Racine Avenue / County Highway Y, north of its intersection with South Swartz Road, at or near 3690 South Racine Avenue, New Berlin, Wisconsin 53146. View from South Racine Avenue. And, yes, I traipsed through the snow -- up to my knees in some points. Things look a lot different when the snow's gone! Lots of parking at this location.